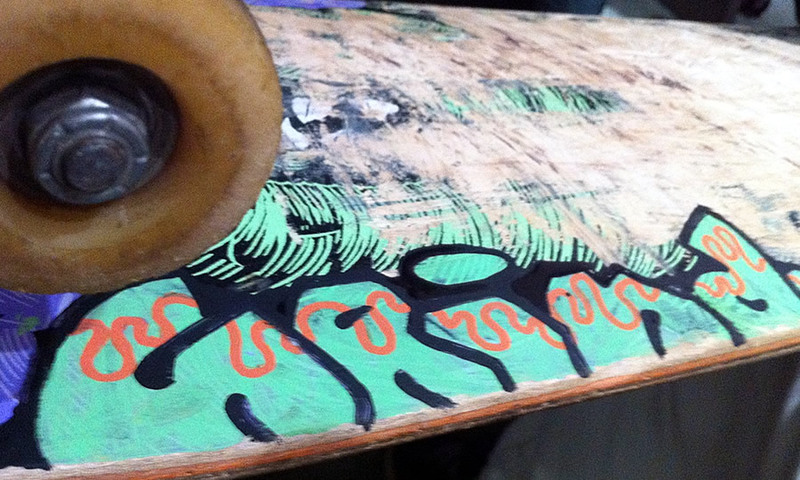 create a piece of deck art on a skateboard deck. this was a quick piece on a friend’s board while listening to a rad presentation on japanese calligraphy at pechakucha 7 in nishinomiya. the artist, shobun setsu, presented his method of pushing the creative boundaries of traditional calligraphy to create new letter forms and expressions. he also talked about various ways of critiquing and appreciate japanese calligraphy of any style. i had some posca-uni with me and went with an old-school candy sorbet melt with black outline. Posted in art.design.life.Tagged decks, design, graf, illustration, paint, skate.